Lee, G., Kim, H., Seo, K., Kim, J., Sitti, M., Seo, T.
Climbing robots have been widely applied in many industries involving hard to access, dangerous, or hazardous environments to replace human workers. Climbing speed, payload capacity, the ability to overcome obstacles, and wall-to-wall transitioning are significant characteristics of climbing robots. Here, multilinked track wheel-type climbing robots are proposed to enhance these characteristics. The robots have been developed for five years in collaboration with three universities: Seoul National University, Carnegie Mellon University, and Yeungnam University. Four types of robots are presented for different applications with different surface attachment methods and mechanisms: MultiTank for indoor sites, Flexible caterpillar robot (FCR) and Combot for heavy industrial sites, and MultiTrack for high-rise buildings. The method of surface attachment is different for each robot and application, and the characteristics of the joints between links are designed as active or passive according to the requirement of a given robot. Conceptual design, practical design, and control issues of such climbing robot types are reported, and a proper choice of the attachment methods and joint type is essential for the successful multilink track wheel-type climbing robot for different surface materials, robot size, and computational costs. 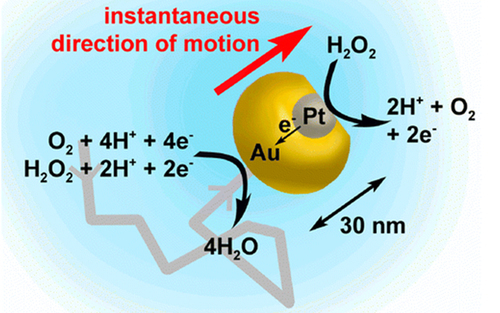 Floreano, Dario, Ijspeert, Auke Jan, Schaal, S.
Segmented molecular design of self-healing proteinaceous materials. Sariola, V., Pena-Francesch, A., Jung, H., Çetinkaya, M., Pacheco, C., Sitti, M., Demirel, M. C.
Hierarchical assembly of self-healing adhesive proteins creates strong and robust structural and interfacial materials, but understanding of the molecular design and structure–property relationships of structural proteins remains unclear. Elucidating this relationship would allow rational design of next generation genetically engineered self-healing structural proteins. 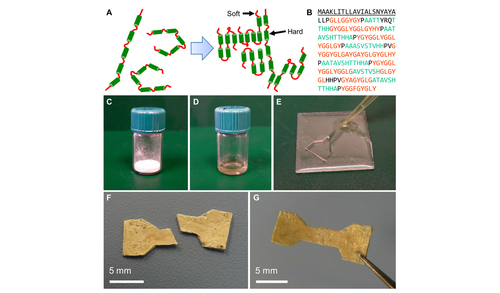 Here we report a general self-healing and -assembly strategy based on a multiphase recombinant protein based material. Segmented structure of the protein shows soft glycine- and tyrosine-rich segments with self-healing capability and hard beta-sheet segments. The soft segments are strongly plasticized by water, lowering the self-healing temperature close to body temperature. 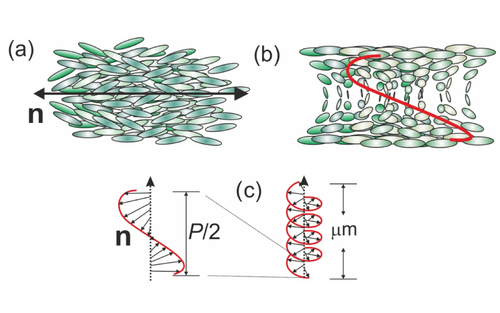 The hard segments self-assemble into nanoconfined domains to reinforce the material. The healing strength scales sublinearly with contact time, which associates with diffusion and wetting of autohesion. The finding suggests that recombinant structural proteins from heterologous expression have potential as strong and repairable engineering materials. 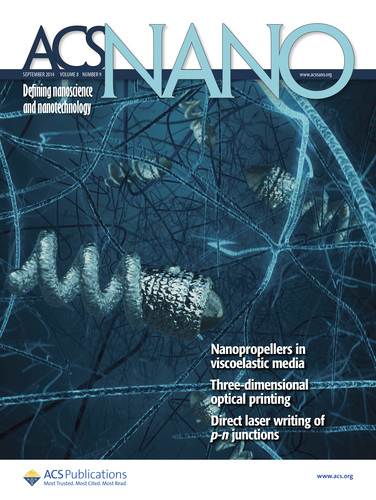 Carlsen, R. W., Sitti, M.
As we move towards the miniaturization of devices to perform tasks at the nano and microscale, it has become increasingly important to develop new methods for actuation, sensing, and control. Over the past decade, bio-hybrid methods have been investigated as a promising new approach to overcome the challenges of scaling down robotic and other functional devices. These methods integrate biological cells with artificial components and therefore, can take advantage of the intrinsic actuation and sensing functionalities of biological cells. 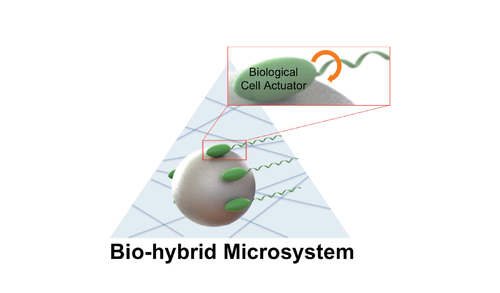 Here, the recent advancements in bio-hybrid actuation are reviewed, and the challenges associated with the design, fabrication, and control of bio-hybrid microsystems are discussed. 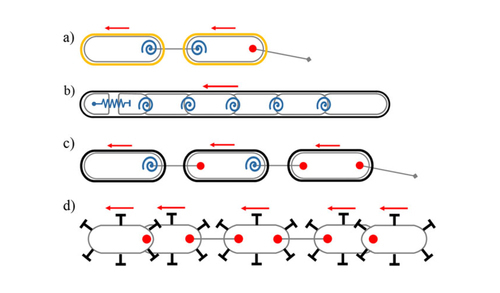 As a case study, focus is put on the development of bacteria-driven microswimmers, which has been investigated as a targeted drug delivery carrier. Finally, a future outlook for the development of these systems is provided. The continued integration of biological and artificial components is envisioned to enable the performance of tasks at a smaller and smaller scale in the future, leading to the parallel and distributed operation of functional systems at the microscale. Atanasov, N., Sankaran, B., Le Ny, J., Pappas, G., Daniilidis, K.
Geiger, A., Lauer, M., Wojek, C., Stiller, C., Urtasun, R.
In this paper, we present a novel probabilistic generative model for multi-object traffic scene understanding from movable platforms which reasons jointly about the 3D scene layout as well as the location and orientation of objects in the scene. 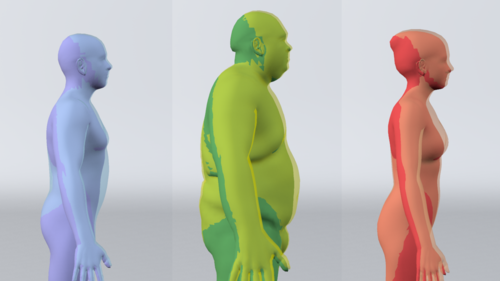 In particular, the scene topology, geometry and traffic activities are inferred from short video sequences. Inspired by the impressive driving capabilities of humans, our model does not rely on GPS, lidar or map knowledge. Instead, it takes advantage of a diverse set of visual cues in the form of vehicle tracklets, vanishing points, semantic scene labels, scene flow and occupancy grids. For each of these cues we propose likelihood functions that are integrated into a probabilistic generative model. We learn all model parameters from training data using contrastive divergence. Experiments conducted on videos of 113 representative intersections show that our approach successfully infers the correct layout in a variety of very challenging scenarios. To evaluate the importance of each feature cue, experiments using different feature combinations are conducted. Furthermore, we show how by employing context derived from the proposed method we are able to improve over the state-of-the-art in terms of object detection and object orientation estimation in challenging and cluttered urban environments. 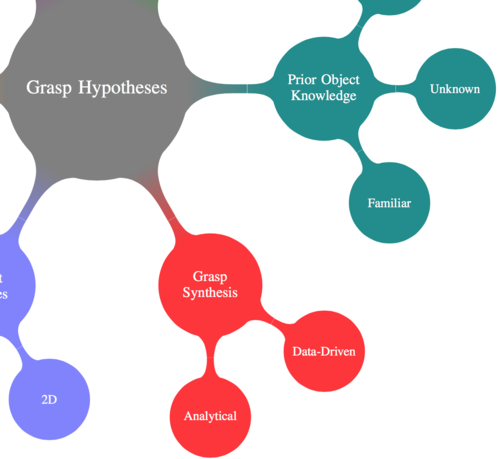 Bohg, J., Morales, A., Asfour, T., Kragic, D.
We review the work on data-driven grasp synthesis and the methodologies for sampling and ranking candidate grasps. We divide the approaches into three groups based on whether they synthesize grasps for known, familiar or unknown objects. This structure allows us to identify common object representations and perceptual processes that facilitate the employed data-driven grasp synthesis technique. In the case of known objects, we concentrate on the approaches that are based on object recognition and pose estimation. In the case of familiar objects, the techniques use some form of a similarity matching to a set of previously encountered objects. Finally for the approaches dealing with unknown objects, the core part is the extraction of specific features that are indicative of good grasps. Our survey provides an overview of the different methodologies and discusses open problems in the area of robot grasping. We also draw a parallel to the classical approaches that rely on analytic formulations. Gerber, P., Schlaffke, L., Heba, S., Greenlee, M., Schultz, T., Schmidt-Wilcke, T.
Fründ, I., Wichmann, F., Macke, J.
Altobelli, N., Lopez-Paz, D., Pilorz, S., Spilker, L., Morishima, R., Brooks, S., Leyrat, C., Deau, E., Edgington, S., Flandes, A.
Bühlmann, P., Peters, J., Ernest, J.
Dann, C., Neumann, G., Peters, J.
Gomez Rodriguez, M., Leskovec, J., Balduzzi, D., Schölkopf, B. Time plays an essential role in the diffusion of information, influence, and disease over networks. In many cases we can only observe when a node is activated by a contagion—when a node learns about a piece of information, makes a decision, adopts a new behavior, or becomes infected with a disease. However, the underlying network connectivity and transmission rates between nodes are unknown. Inferring the underlying diffusion dynamics is important because it leads to new insights and enables forecasting, as well as influencing or containing information propagation. In this paper we model diffusion as a continuous temporal process occurring at different rates over a latent, unobserved network that may change over time. Given information diffusion data, we infer the edges and dynamics of the underlying network. Our model naturally imposes sparse solutions and requires no parameter tuning. We develop an efficient inference algorithm that uses stochastic convex optimization to compute online estimates of the edges and transmission rates. We evaluate our method by tracking information diffusion among 3.3 million mainstream media sites and blogs, and experiment with more than 179 million different instances of information spreading over the network in a one-year period. We apply our network inference algorithm to the top 5,000 media sites and blogs and report several interesting observations. First, information pathways for general recurrent topics are more stable across time than for on-going news events. Second, clusters of news media sites and blogs often emerge and vanish in a matter of days for on-going news events. Finally, major events, for example, large scale civil unrest as in the Libyan civil war or Syrian uprising, increase the number of information pathways among blogs, and also increase the network centrality of blogs and social media sites. Chen, Z., Zhang, K., Chan, L., Schölkopf, B.
Zscheischler, J., Michalak, A., Schwalm, M., Mahecha, M., Huntzinger, D., Reichstein, M., Berthier, G., Ciais, P., Cook, R., El-Masri, B., Huang, M., Ito, A., Jain, A., King, A., Lei, H., Lu, C., Mao, J., Peng, S., Poulter, B., Ricciuto, D., Shi, X., Tao, B., Tian, H., Viovy, N., Wang, W., Wei, Y., Yang, J., Zeng, N.
Objective. Brain–computer interface (BCI) systems are often based on motor- and/or sensory processes that are known to be impaired in late stages of amyotrophic lateral sclerosis (ALS). We propose a novel BCI designed for patients in late stages of ALS that only requires high-level cognitive processes to transmit information from the user to the BCI. Approach. We trained subjects via EEG-based neurofeedback to self-regulate the amplitude of gamma-oscillations in the superior parietal cortex (SPC). We argue that parietal gamma-oscillations are likely to be associated with high-level attentional processes, thereby providing a communication channel that does not rely on the integrity of sensory- and/or motor-pathways impaired in late stages of ALS. Main results. Healthy subjects quickly learned to self-regulate gamma-power in the SPC by alternating between states of focused attention and relaxed wakefulness, resulting in an average decoding accuracy of 70.2%. One locked-in ALS patient (ALS-FRS-R score of zero) achieved an average decoding accuracy significantly above chance-level though insufficient for communication (55.8%). Significance. Self-regulation of gamma-power in the SPC is a feasible paradigm for brain–computer interfacing and may be preserved in late stages of ALS. This provides a novel approach to testing whether completely locked-in ALS patients retain the capacity for goal-directed thinking. 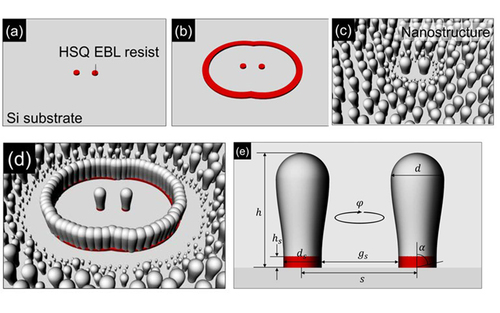 Babbar, R., Metzig, C., Partalas, I., Gaussier, E., Amini, M.
Meyer, T., Peters, J., Zander, T., Schölkopf, B., Grosse-Wentrup, M.
Ben Amor, H., Saxena, A., Hudson, N., Peters, J.
Probst, S., Wiehr, S., Mantlik, F., Schmidt, H., Kolb, A., Münch, P., Delcuratolo, M., Stubenrauch, F., Pichler, B., Iftner, T.
Zscheischler, J., Reichstein, M., Harmeling, S., Rammig, A., Tomelleri, E., Mahecha, M.
Bocsi, B., Csató, L., Peters, J.
v Buttlar, J., Zscheischler, J., Mahecha, M.
Schmidt, H., Schwenzer, N., Bezrukov, I., Mantlik, F., Kolb, A., Kupferschläger, J., Pichler, B.
Wierstra, D., Schaul, T., Glasmachers, T., Sun, Y., Peters, J., Schmidhuber, J.
Solly, E., Schöning, I., Boch, S., Kandeler, E., Marhan, S., Michalzik, B., Müller, J., Zscheischler, J., Trumbore, S., Schrumpf, M.
Zscheischler, J., Mahecha, M., v Buttlar, J., Harmeling, S., Jung, M., Rammig, A., Randerson, J., Schölkopf, B., Seneviratne, S., Tomelleri, E., Zaehle, S., Reichstein, M.
Mülling, K., Boularias, A., Mohler, B., Schölkopf, B., Peters, J.
Pillonetto, G., Dinuzzo, F., Chen, T., De Nicolao, G., Ljung, L.
Kolb, A., Parl, C., Mantlik, F., Liu, C., Lorenz, E., Renker, D., Pichler, B.
Sanchez-Castillo, A., Eslami, S., Giesselmann, F., Fischer, P.
Schäfer, J. F., Gatidis, S., Schmidt, H., Gückel, B., Bezrukov, I., Pfannenberg, C. A., Reimold, M., M., E., Fuchs, J., Claussen, C. D., Schwenzer, N. F.
Persello, C., Boularias, A., Dalponte, M., Gobakken, T., Naesset, E., Schölkopf, B.
Barbero, A. J., Sra, S.
Disselhorst, J. A., Bezrukov, I., Kolb, A., Parl, C., Pichler, B. J.